Crown Prince Rudolf of Austria (21 August 1858 – 30 January 1889) was the son and heir of Emperor Franz Josef of Austria and Elisabeth of Austria. His death, apparently through suicide, along with that of his mistress, Baroness Mary Vetsera at his Mayerling hunting lodge in 1889 made international headlines, fueled international conspiracy rumours and ultimately may have sealed the long-term fate of the Habsburg monarchy. In contrast with his deeply conservative father, Crown Prince Rudolf held distinctively liberal views that were closer to those of his mother. Nevertheless his relationship with her was strained and contained little warmth. On May 10, 1881, he married Princess Stéphanie of Belgium, a daughter of King Léopold II, in the Augustinian Church in Vienna with all the pomp and splendour of a state wedding. Rudolf appeared to be genuinely in love, but his mother regarded her new daughter-in-law as a “clumsy oaf.” By the time their only child, the Archduchess Elizabeth, was born on September 2, 1883, the couple had drifted apart, and he found solace in drink and female companionship. In 1887, Rudolf bought Mayerling and adapted it into a hunting lodge. In the autumn of 1888, the 30-year-old crown prince met the 17-year-old Baroness Marie Vetsera, known by the more fashionable Anglophile name Mary. From the start, Mary adored him, and was ready to do anything for him. It was almost certainly not the great romance of his life, but Rudolf did have feelings for her, and was touched by her limitless, almost fanatical, love for him. 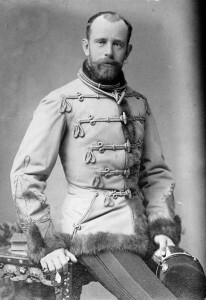 According to official reports, their deaths were a result of Franz Josef’s demand that the couple end the relationship: the Crown Prince, as part of a suicide pact, shot his mistress in the head, then himself. Rudolf was officially declared to have been in a state of “mental unbalance” in order to enable burial in the Imperial Crypt (Kapuzinergruft) of the Capuchin Church in Vienna. Mary’s body was smuggled out of Mayerling in the middle of the night, and secretly buried in the cemetery of Holy Cross Abbey in Heiligenkreuz and the Emperor had Mayerling converted into a penitential convent of Carmelite nuns. Many people however doubted the truthfulness of the report. Before her death in 1989, Empress Zita, widow of the last Austrian emperor, Karl (r. 1916–1918), repeated the claim that the young couple had been murdered as part of a conspiracy to silence Rudolf after he had refused to take part in a French plot to depose his pro-German conservative father and assume the control as a pro-French liberal Austrian emperor. Empress Zita did not offer any new evidence and her claims, however widely rumoured, were not given much credence during her lifetime. In December 1992 the remains of Baroness Vetsera were stolen from the cemetery at Heiligenkreuz. When the missing remains were tracked down, the police, to ensure they were the correct remains, asked the Viennese Medical Institute to examine them. While they did confirm that they were the correct remains, the institution noted how the skull contained no evidence whatsoever of a bullet hole, the supposed means by which Vetsera had been killed by the crown prince. The evidence instead suggested she may have been killed by a series of violent blows to the head. Separately, evidence came to light in the form of a report on the remains of the crown prince, made at the time of the double death. His body showed evidence of a major violent struggle. A report at the time had also noted that all six bullets had been fired from the gun, which it was revealed did not belong to the crown prince. The official state report of the deaths claimed that the crown prince shot Vetsera before shooting himself with his own gun. It made no mention of the facts subsequently revealed, leading to the conclusion that for some reason a cover-up of the actual manner of the deaths had taken place. It is unlikely ever to be clarified as to what really happened. Two theories have been postulated. One is that the couple had a violent struggle and that the crown prince murdered his lover by battering her before shooting himself; in other words, a clear case of murder rather than the suggested double suicide. However, that theory fails to explain the ability of the prince to fire the gun six times as he killed himself, or indeed where the gun came from, given that it was not his weapon. The other theory is that some third party attacked both, battered Vetsera to death, and shot the crown prince. The latter theory does bear some resemblance to the theory postulated for eighty years by Empress Zita, who as Crown Princess from 1914 to 1916 had been a confidante of Rudolf’s father, Emperor Franz Josef, and so may have heard his theories, and those of other members of the Austro-Hungarian court, as to the manner of the death of Crown Prince Rudolf. However, it must be understood how difficult it was for the emperor to admit that his son and heir had killed the girl and himself in a state of “mental unbalance”. If there had been any way to claim that the two had been murdered by a third party, that version would have been infinitely preferable. There would have been no need to accuse someone in particular; it would have avoided the public admission that the crown prince was a mad killer and that he had committed suicide. Following the death of the emperor’s only son, the marriage of Franz Josef and Elisabeth collapsed completely, with the empress spending much of her time abroad, particularly in England and Ireland where she loved to hunt. The new heir presumptive to the Austrian, Bohemian and Hungarian thrones was Archduke Karl Ludwig, eldest surviving brother of the emperor. After Karl Ludwig’s death, his oldest son, Archduke Franz Ferdinand became heir presumptive. His assassination in 1914 led a chain of events that produced World War I. Had Rudolf lived, it is possible that Emperor Franz Josef would have abdicated as had his uncle, passing the thrones to an emperor who was much more liberal in outlook and opposed to Austria’s military alliance with Kaiser Wilhelm II’s Germany that played such a part in triggering the First World War. Instead however, the throne ultimately went to Franz Josef’s grand-nephew, Karl, who in 1916 became the last Austrian emperor as Emperor Karl, and who, though he tried, was unable to stop the war and to save the Habsburg monarchy from final collapse. The historian Brigitte Hamann meticulously researched Rudolf's life and deals with the Mayerling incident in great detail in chapters 13 and 14 of "Kronprinz Rudolf. Ein Leben," (Amalthea 2005). An English translation of her book has just been published by Peter Lang Inc. and is now available at Amazon.com or directly from the publisher. it contains eye witness accounts of the events in Mayerling and discredits many rumors concerning this affair.